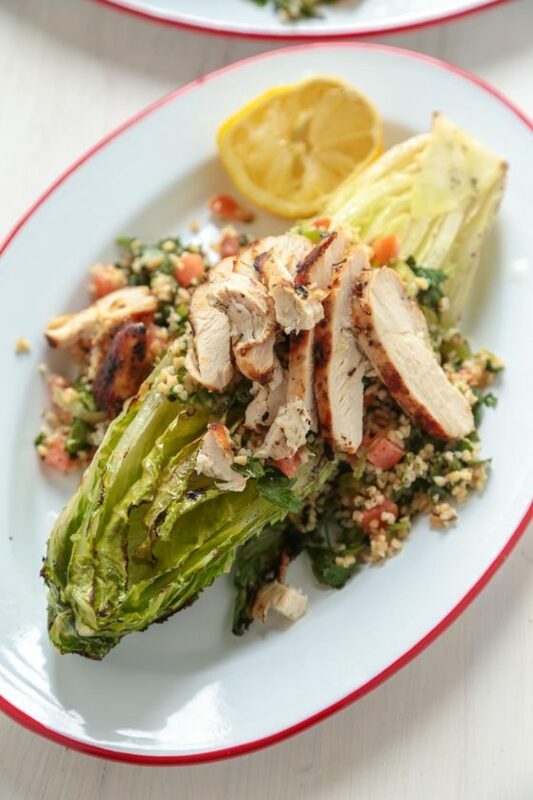 This grilled chicken Caesar tabbouleh salad is a mix of multiple backgrounds, and brings all the flavors of them all together! Ben and I are bad at date nights. Planning them. And apparently, at executing them as well. Despite our best efforts to try and get around the split schedules of night shift/day shift, and to get him to wake up early enough to go out before it’s time for me to go to bed, and them pick out what we want to do, we have to plan where we want to go at least a week in advance. This week, we did just that. We set alarms. Had a plan. Looked up tickets. I curled my hair. Put on lipstick. And we still missed the mark! We don’t get into downtown Seattle much, and one of the places I’d been wanting to visit was the local Chihuily glass museum. Nifty. So we got ready, left the house, and go figure – I needed to get gas in the car. Then we hit traffic. Then there was a political event right next door. Then parking was a nigthmare. And then…. by the time we would have found somewhere to park, they would have sold the last ticket, so we scrapped it, drove around Seattle, decided we couldn’t think of anything else we wanted to do downtown – besides avoid hitting pedestrians or getting hit by other terrible drivers – and we found our way back to our hometown. But what we did find was a new brewery that we had been meaning to try!! So, even if we went into downtown Seattle, just to come all the way back home again, our date night turned out pretty dang great! We had a great meal, even better conversation, and long over due quality time with that guy I’ve hitched myself to for all eternity. Not a half bad way to spend a Saturday night. 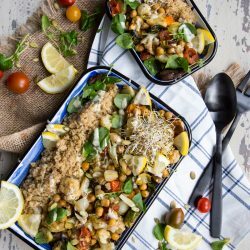 Prepare Tabbouleh salad ahead of time and let meld until ready to use. In a plastic bag, pour in lemon juice, 2 Tbsp olive oil, salt, pepper, Oregano, garlic, and Italian seasoning. Seal the bag, and mash the bag together to combine the ingredients. Add in the chicken breast and marinate for one hour. Preheat the grill over medium high heat. Using a large knife, slice the head of Romaine lengthwise. Be sure not to slice the base off, as this will hold the leaves together on the grill. Brush the last tablespoon of olive oil over the head of Romaine. Place the chicken breast on the grill, and cook until it registers 165 degrees. Let it rest for 5 minutes, before slicing and serving on salad. While the chicken is grilling, place the romaine on the grill and allow to get crispy and char slightly - about two minutes. Turn and repeat until all sides are charred slightly. Remove from the grill and plate. 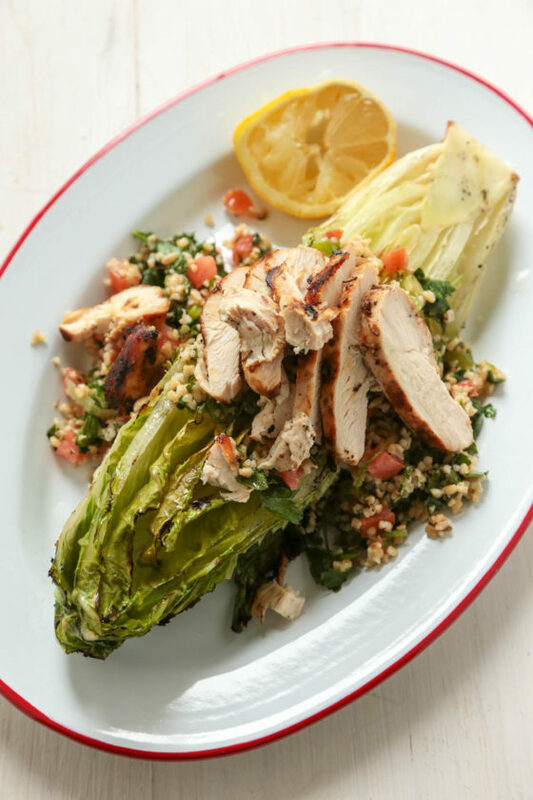 Top grilled head of Romaine with prepared tabbouleh, sliced chicken, and Caesar dressing. Serve immediately. Gorgeous photos! And definitely something I need after last weeks spring break gluttony! I’m seriously in love with this salad! 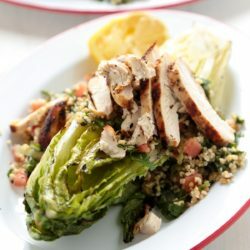 I have a serious obsession with tabbouleh, but never have I ever thought to pair it with chicken caesar. This is just brilliant! 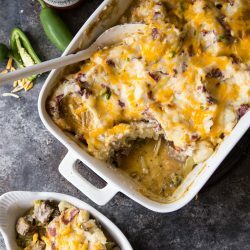 Wonderful mashup of great flavors! I love grilling lettuce. This looks amazing! I can’t wait to try this salad! At least you were together 🙂 This salad looks delish! 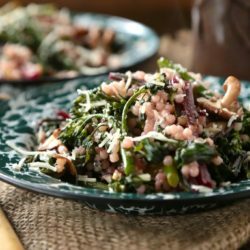 I love this creative twist on a caesar salad! One door closes and another one opens…sounds like it was still a fun time! I love the Seattle Chihuily, btw. 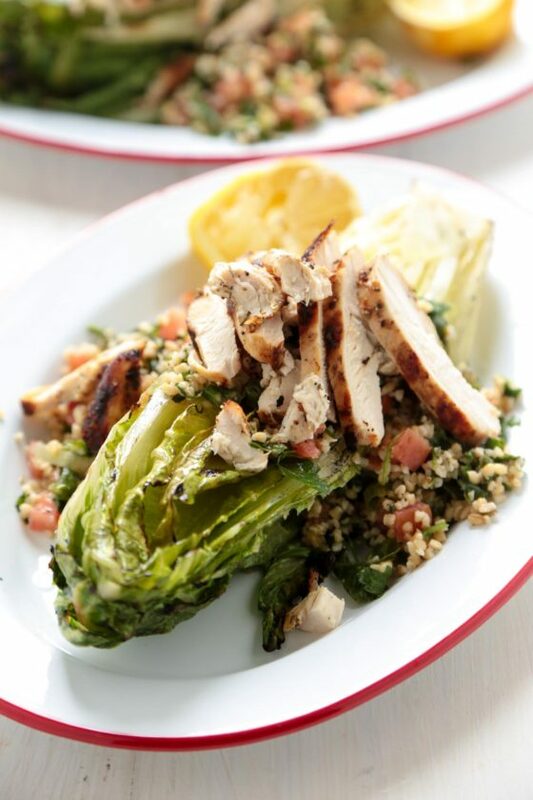 And this salad – yes please, amazing – love the grilled romaine. Glad your date night turned out on a good note after all. It’s great when a restaurant that you’ve been meaning to try lives up to expectations. Great looking salad. I love grilled romaine! Love the combo of this. 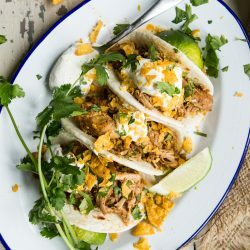 It would be great to have this for lunch or dinner! I’m not always the best planner either. 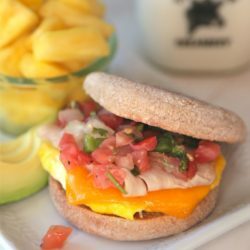 This looks healthy, fresh, and delicious! 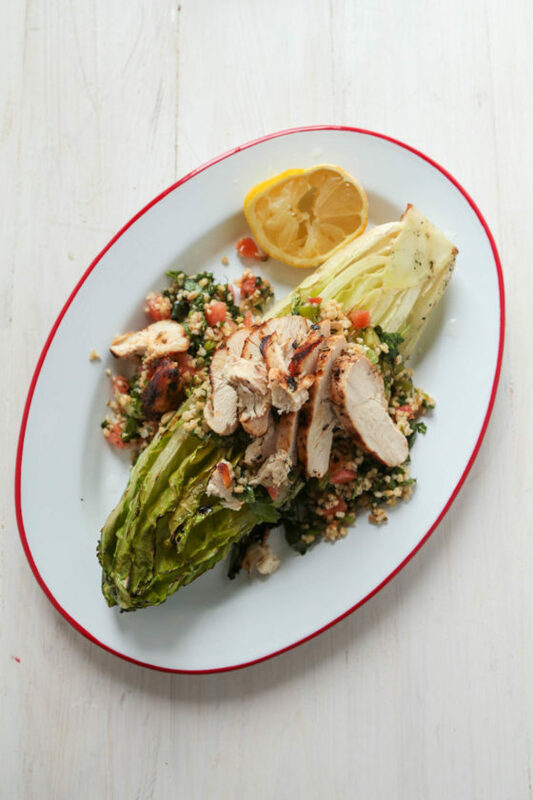 Oh ma gawwd…my post tomorrow is a chicken salad with grilled romaine!! A total coincidence I promise lol. Yours looks so good on the tabbouleh, good call!! Great minds Obviously think alike!! I can’t wait to see if Gerry!! Going to be in the 80’s this weekend (sorry), so this would be a perfect idea for the grill! I love me a good caesar salad, but this caesar blows all the other caesars of the world out of the water..